Conference paper: "A transforming minority. The search for trans-confessional universalism on the margins of religious division in the medieval al-Andalus", Iberian (In)tolerance: Minorities, Cultural Exchanges, and Social Exclusion in the Middle Ages and Early Modern Era, LAHP, London, 8-9.11.2018. In this presentation, I will try to outline the invention of mystical elitism that can be situated around the 11th – 12th c. in al-Andalus. This concept implies the idea that inspired individuals, exceptionally committed to spiritual quest, form a particular network, slowly transforming the general society and conducing it, although in a non-obvious or non-visible way, on a path towards illuminated wisdom. Such an idea may be read, for instance, in The Rule of the Solitary, a kind of philosophical tale by Ibn Bajja (c. 1085-1138). With the later figures of Andalusian Sufism, such as Ibn Tufail (1105-1185) and Ibn Arabi (1165-1240), the idea of trans-denominational character of the mystical community progressively becomes clear. At the same time, the awareness of a kind of double truth in religious matters gains importance. The denominational order remains valid for the predominant, non-illuminated part of the society, living a religious life made of norms, rituals and boundaries; in the meanwhile, the spiritual elite is able to construe the hidden unity of monotheistic religions. This universalist transreligious minority is bound to keep its distance in relation to the majority living in the world of denominational divisions, while it secretly works for the general evolution towards a hypothetical post-denominational stage, in which the fullness of illuminated tolerance might become possible. In the meanwhile, religious division and coexistence of denominations is to be preserved as a fragile, worldly state of equilibrium. Although, historically speaking, the state of equilibrium was ultimately broken, with the victory of the Iberian Catholicism and the destruction of the remaining religious spheres, this early example may eventually be seen in light of the contemporary cultural theory as an illustration of the Agambenian concept of the “coming community”, with its moving frontiers in a sort of fractal development of a dynamic ideal. Conversation: "Pour une Renaissance transculturelle? ", Centre des Etudes Supérieures de la Renaissance, Tours, 4.12.2017. ​Lecture: "Defining the symbolic space. 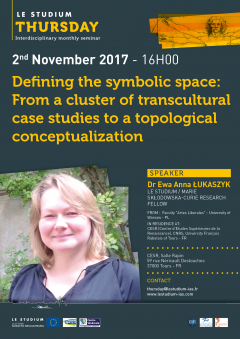 From a cluster of transcultural case studies to a topological conceptualisation", LE STUDIUM Loire Valley Institute for Advanced Studies, Tours, 2.11.2017. ​Conference paper: "Looking deeper into the desert while travelling to Egypt, Syria and Palestine. Romantic construct of Arabia and the Wahhabism in the travelogue of Juliusz Słowacki (1836-1837)", 33. Deutscher Orientalistentag "Asia, Africa and Europe", Friedrich Schiller University, Jena, 18-22.09.2017. Conference paper: "Congregatio mundi today. Neohumanist perspectives of Guillaume Postel (1510-1581)", "European Humanism and its Challenges", Ljubljana, 8-9.09.2017. Conference paper: "Comparative literature in Poland: the mole reads the world", Colloque international "Comparer en Europe. Enjeux et défis du comparatisme européen", Institut de Recherche en Langues et Littératures Européennes - ILLE, University of Upper-Alsace, Mulhouse, 22-23.06.2017. Conference paper: "The language of Adam and early modern transcultural aspirations. 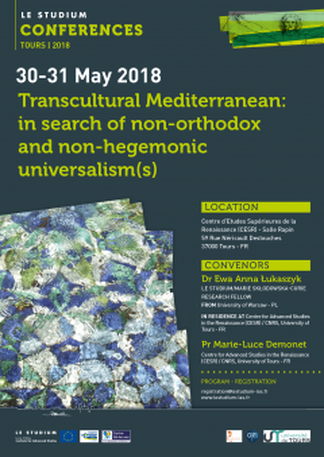 The Oriental project of Guillaume Postel", The Third International Conference on the History of Arabic Literature, Taras Shevchenko National University, Kyiv, 18-19.05.2017.
International Conference "Transcultural Mediterranean: in search of non-orthodox and non-hegemonic universalism(s)", Centre d'Études Supérieures de la Renaissance, Tours, 30-31.05.2018.